Suitable for machining complex parts in industries ranging from automotive to medical technology, Multiline MS22C-8 can be configured to operate as 8-spindle machine, double 4-spindle machine, or machine with double rear end machining. Each of 8 spindles, arranged in spindle drum, are assigned 2 cross-slides which can travel on both X and Z-axis. Speed of liquid-cooled spindles can be controlled separately. 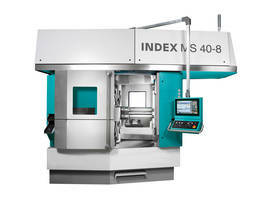 When operated as 8-spindle machine, drum indexing angle from spindle to spindle is 45Â°. 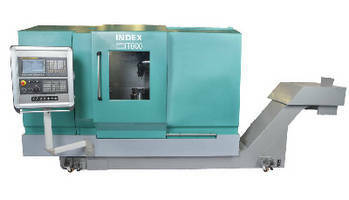 INDEX, the multi-spindle specialist, introduces the new MS22C-8, from its Multiline series. The new modular eight-spindle machine opens up additional opportunities for already unbeatably fast multi-spindle parts machining, especially highly complex parts. The INDEX MS22C-8 NC multi-spindle automatic lathe has many applications throughout industries ranging from automotive to medical technology. It also produces small batches efficiently and economically. The versatile INDEX MS22C-8 can be bar-fed or loaded with chucked parts. 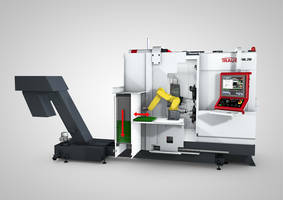 o a machine with double rear end machining. The MS22C-8 can accomplish turning, off-center drilling and thread cutting, inclined and cross-drilling, milling, multi-edge turning, hobbing, tooth milling, deep-hole drilling or slotting. Another benefit for the user is that all standard tool holders and tool holder system interfaces can be used with a range of popular adapters (Capto, HSK, VDI, INDEX systems). Each of the eight spindles, arranged in the well-known INDEX spindle drum, are assigned two cross-slides which can travel both on the X as well as on the Z-axis. 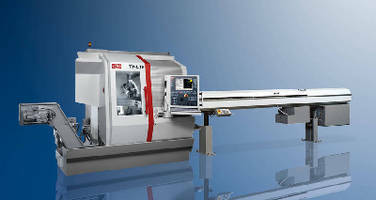 Each cross-slide can be additionally equipped with a Y-axis. Up to two swiveling synchronous spindles permit simultaneous rear end machining. Combined with a total of up to 16 cross-slides, the new eight-spindle machine is therefore a true multi-talent even for highly complex machining. The speed of each of the eight liquid-cooled spindles can be controlled separately. The fluid-cooled spindle drum keeps the thermal growth in the spindle carrier to a minimum. The advantage compared to the previous air-cooling approach is the higher power density in the spindle drum and the capability of energy recovery from the heated cooling fluid. In addition, the spindle bearing temperature can be kept at a low level, which also prolongs its service life and improves thermal stability. The cross slides with integrated drive have a low-mass design with hydrostatic bearing support. Their low moment of inertia and resulting high dynamics facilitates outstanding acceleration in operation. The new MS22C-8 in double four-spindle mode actually runs as two machines working with one another simultaneously on a single base. Every second tool station always has simultaneous access to the same tools. 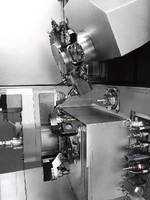 When operated as an eight-spindle machine, the drum indexing angle from spindle to spindle is 45°; if the machine operates with two times four spindles, the drum indexing angle is 90°. Results from double four-spindle machining: two finished parts are produced by the machine per work cycle. In double rear end machining, there are six spindle positions available for front machining the workpiece and two spindle positions for rear end machining, and they all work simultaneously. With this approach, it is possible to machine the rear end of a workpiece during two drum indexing cycles. The advantage of hydrostatic sliding guide in the feed axis (Z) is their outstanding damping characteristic that prevents the transfer of the machining vibrations to the adjacent slide via the headstock. This helps to mitigate vibration and rattling while workpieces are being machined - even when the most diverse machining processes are being performed concurrently by the eight spindles. For example, one spindle can be used for heavy-duty roughing while high-precision finishing takes place on another spindle without sacrificing surface quality. In addition, the hydrostatic bearing is wear-free - there is neither friction nor a stick-slip effect. The swiveling synchronous spindles are locked into the end positions by three-part Hirth couplings. The high level of stiffness that this achieves also guarantees that even with bar diameters up to 24 mm, rear end machining operations with very high cutting volumes and simultaneously high machining precision can be performed. The Hirth coupling also means it is no longer necessary to electronically compensate at the end position. The mechanical lock ensures optimal stiffness and increases the positioning accuracy. This allows even highly complex components to be produced that require complex cut-off side machining. The swivel movement to the rear end position occurs in less than 0.3 seconds. The advantage of the front-opening design for the operator is the excellent accessibility during setup and tooling. Moreover, there is the free chip flow down into the chip discharge chute. To save space, the INDEX engineers simply placed the control cabinet "on the machine". This principle of integrating the control cabinet into the machine roof has been applied to INDEX multi-spindle machines for almost 15 years and has been very well received in the market. Discharging workpieces damage-free from the work area and placed on pallets in the right position for later treatment, the MS22C-8 can include optional handling solutions: machine- integrated handling with external stacking unit that ensures both destruction-free removal of parts from the machine, including measuring operations for the workpieces if needed. Workpiece data can be fed back directly to the machine control so it can automatically correct its machining parameters. 5. intelligent cooling principles for targeted cooling of the machine and reuse of waste heat. The INDEX cooling concept ensures that the spindles, hydraulics, and control cabinet are cooled constantly and that the heat can be supplied to a different application via a "cold water interface," e.g., for service water heating or as process heat for other manufacturing purposes.